Through some Internet searching I came across a Yahoo group called HNPP for those diagnosed with or with the symptoms of HNPP. I recently joined and am very excited to learn more from these individuals and hopefully find some children suffering from this disease as my daughter is that she can connect with. Here is a link if this group is right for you. I found this interesting article with some good information explaining how CMT and HNPP relate. In the late 1980s, while the CMT gene hunt was gaining momentum, neurologist Phillip Chance was searching for the genetic cause of an apparently unrelated neuropathy — hereditary neuropathy with liability to pressure palsies (HNPP). To his surprise, Chance's investigation revealed that HNPP and most CMT1 cases result from the same mutation event. Once that mutation occurs, the emergence of either HNPP or CMT1 in a family is sort of like flipping a coin.HNPP is an inherited disorder that causes temporary attacks of paralysis typically localized to a single limb. Those attacks take weeks to months to recover from, and are brought on by palsy — the malfunction of a peripheral nerve that serves the affected limb. "[HNPP] is so different clinically from CMT," says Chance, "that few people suspected it had anything to do with CMT." But in 1992, Chance published an MDA-funded study showing that HNPP is genetically related to the most common form of CMT1 — CMT1A. Earlier that year, MDA-funded researchers had established that CMT1A is caused by a duplication of the PMP22 gene on chromosome 17. (It's important to remember that, except for the X and Y chromosomes, everyone normally has two copies of each chromosome, one from dad's sperm and one from mom's egg. So, having the duplication means that a person has three copies of the PMP22 gene.) The resulting overproduction of the PMP22 protein — a component of myelin — is somehow detrimental to Schwann cells.Though it's a rare event, the duplication usually arises while single copies of dad's chromosomes are being parceled into his sperm. As his two copies of chromosome 17 are preparing for separation into the sperm, a piece of genetic material containing PMP22 is accidentally removed from one copy of the chromosome and inserted into the other. So, one sperm receives an extra PMP22 gene, and one sperm loses its PMP22 gene. "The existence of the duplication predicted that there would be a reciprocal deletion, but it was generally assumed that the deletion would be lethal, of no consequence, or it could have resulted in a disorder which wasn't necessarily a peripheral neuropathy," says Chance, who's now at the University of Washington in Seattle.Chance's research showed that deletion of the PMP22 gene — the flip side of the mutation underlying CMT1A — is the cause of HNPP. "We had no reason to think that studying HNPP would give us any particular insights into CMT," says Chance. But it has helped make clear that peripheral nerve is sensitive to high or low levels of PMP22. "The relationship with CMT has also done a lot to bring HNPP into the clinical arena," says Chance. 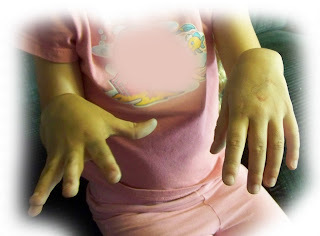 Almost two years ago my oldest daughter who was six at the time suddenly lost some of the use of her left hand. It was instant and without apparent injury. She could not lift her her hand at the wrist, could not make a fist, could not spread her fingers and had a very weak grip. I thought she had just slept on her hand funny and that it would come back. She later told me that it had actually stopped working the night before when she was listening to her Aunt read her a story. She was doing nothing at all, just resting her head on her hands propped up on her elbows It didn't improve and upon visiting the doctor he rushed us to Primary Children's Hospital for immediate tests which all came back normal. A relief, but she was obviously not normal so the tests continued. Over several months she had X-rays, CAT scans, MRIs with and without contrast, ultrasounds, a nerve conduction test, numerous physicals, and so on. All that was determined was that she did have nerve damage and they had no idea why. We were so sick of doctors and tests with no answers and she wasn't getting any better. One symptom she did not have was pain, thankfully. There was mention of a possible genetic nerve disorder being the cause by the pediatric neurologist. She said that this disease allows the nerves to be injured more easily but I completely dismissed it. She wasn't DOING anything. How could that injure the nerves, more vulnerable or not. Plus, I had never heard of anything at all like this happening in my family or my husband in his. The only option they gave us for help was surgery on her elbow to move her nerves. My husband and I were not comfortable with this especially when it wasn't clear why or how the nerve damage occurred and requested that we try physical therapy. We were referred to a wonderful group of therapists and the actual type she received is called occupational therapy. Her therapist began aggressive treatments. We would visit several times a week at first where he taught her at home exercises to do and he would shock her muscles in the hand and arm to force contractions. She had almost complete atrophy at this point. Her progress was very slow in the beginning but once she regained some muscle her movement and ability improved very quickly and within a few more months she had complete recovery except for a small section of her arm that still has no feeling. It was bizarre but we were very thankful and thought we were done with that. Almost exactly a year after the first injury she was playing a boxing game on the wii when suddenly she lost strength in her right hand, arm, shoulder and back. I immediately took her into the therapists and he was shocked by the second injury and even more that it was with the other hand. He did some work with her but said we needed to go back to the doctors. I really didn't want her to go through all of that again but we went back to the pediatrician who sent us back to the neurologist. To my surprise, the neurologist said with almost complete certainty that it was the genetic nerve disease causing the problem. I had expected more confusion but this second injury had brought more clarity. All she needed was a blood test to confirm and we would go from there. I took down the name of the disease this time and began my own research. Unfortunately, there is not a lot of information out there and because it is so rare in the general population, most doctors have not even heard of it. This is the reason it took so long to get it diagnosed and is also the reason many people with this disease get improper treatment if any at all and will often go undiagnosed. It is rare in the general population but anyone that has it will find it very common in their family. This is because you cannot be a carrier of this disease. You either have it or you don't. If you do, there is a 50% chance that you will pass it on to each child. Since our daughter was confirmed to have this disease, it meant that either my husband or I did have it, and then one of our parents and then one of theirs, and so on, not to mention any number of extended family members that inherited it as well. I was able to find one good website with information that has just been compiled by those who also have experience with this disease hnpp.org After studying these pages I came to understand how varied in severity this disease can be and that it can affect any part of the body. I came to recognize the symptoms and once I had learned what questions to ask I began interviewing our families about their related medical history. I was amazed at how easily I was able to find those with the disease. Even my own husband's injuries, which he had had, we thought were not at all connected until we began studying about HNPP. For example, my husband had weakness in his arms when he would hold them above his head. This finally bothered him enough that he went to a doctor which referred him to a therapist. The therapist did some testing on him and was very confused by it. He said that based on where he lacked movement and strength he had all the symptoms of someone who had torn their rotary cuff except he had no pain. He gave him some exercises to do which helped and that was the end of it. An example of one of his milder symptoms is when he gets his blood pressure checked his entire arm goes numb for about five minutes. Most people who are bothered enough by an HNPP related nerve injury to see a doctor never make it far enough along to get to a neurologist, which are the only doctors that would even know to look for that as a cause. This disease is not too bad if you must have a disease. It is labeled as a nuisance disease because the injuries are usually mild in nature and the weakness is often regained over time as the nerves heal. It also doesn't usually express in children. Because our daughter has already had two "severe" injuries the neurologist suspects she has a severe case of the disease. It is not life threatening and if you know what to watch for and are careful in your activities, you can avoid a lot of injuries. We have learned it has been passed through the Renstrom line at least as far back as Andrew Renstrom. There is even one line of cousins that is already aware of this disease and had already been tested and confirmed to have HNPP. I have not been able to trace it beyond but Andrew's grandson believes these nerve problems were common in the village he came from in Sweden. Why Should I Watch for it? Surgery will not help a nerve injury in someone who has HNPP and most likely will only cause more nerve damage. It is important to be aware of this family condition to potentially prevent unnecessary tests, doctors bills, surgeries and injuries. How Does Having HNPP make nerves more susceptible to Injury? The myelin coating that covers the nerves acts as a rubber band and coating to keep them protected and in place. With HNPP the myelin has lost its "elasticity" and once a nerve is stretched, it is left exposed and vulnerable. Normal daily activities can cause nerve injury to someone with this disease. How Do I Prevent an HNPP Related Injury? The nerves being extended too far, worn from repeated movement, or have too much pressure applied can cause injury. As a mother this is frustrating because it sounds like there is no way to protect my daughter. But the best way is to avoid repetitive movements by changing up what you are doing often, avoid pressure by changing how you are resting or sitting often, and avoid over stretching by not pushing your body to the limits of its ability. I am not a doctor and am simply sharing what I have learned through our experiences with our family and from my research and our daughter's doctors. Each person will vary greatly on how their body reacts to stress placed on the nerves. If you do have this disease, get to know your limits and do not push them. I wanted to put this information out there so any possible family members that may have related symptoms can get properly diagnosed. My oldest girl is at MDA Summer Camp for the first time this year. Once she was confirmed to have HNPP an MDA counselor met with us and informed us that she has one of the neuromuscular diseases that is part of the MDA organization. She told us about summer camp and ever since she has been looking forward to it. It is almost a week long event and full of fun activities for the kids. This is the longest she has ever been away from us but that didn't seem to bother her, she was all excitement when I dropped her off on Thursday. Her wish is to meet someone, a kid, like her with similar problems. Although her father has this same disease and others in the extended family, it wasn't the same to her. I hope she will be able to learn a lot from this experience. We are one of the lucky ones if you can call a disease lucky. It is not life threatening and often not life altering. 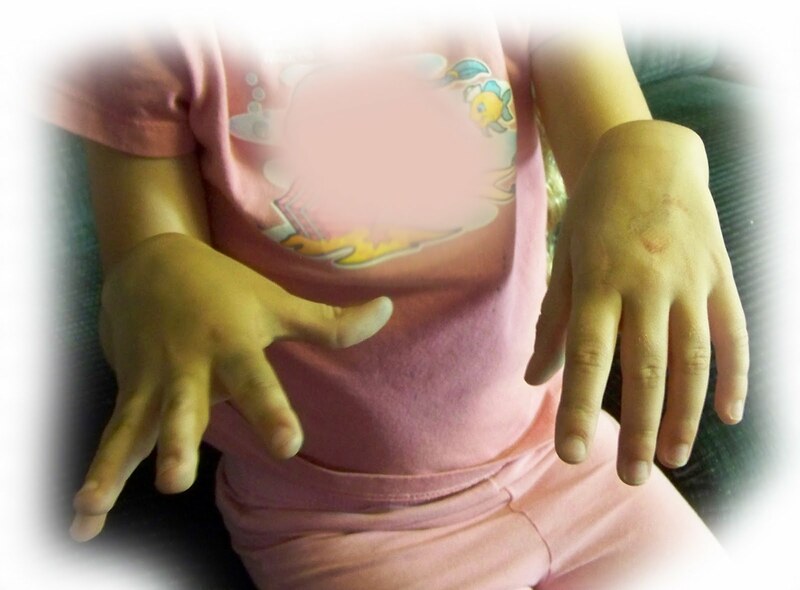 She is unusual in that her disease expressed in her at such a young age, 6 yrs, and that she has had two nerve damaging injuries already. Her pediatric neurologist thinks she has a severe case. There are many children she will meet here dealing with much worse physical challenges and even facing the fact that they will not live a full life. I feel for these families and going through the challenges I did with my child and seeing her having to adapt, being physically challenged and noticed for it, all with the fear of the unknown, we didn't know what was causing it. I have developed a new perspective and great compassion for those who suffer in such a way. I am interested to see how this experience will affect her. I am very grateful to all who have helped my daughter through her struggles, helped us get the diagnosis, showed kindness and compassion, and for all those wonderful people who donate with time and funds to the MDA programs and research work. Your help is noticed and deeply felt. There is a 50% chance that each of my other children will have this disease as well. I haven't had them tested yet, but plan to soon. In most of the family cases that we know of now, their symptoms are not severe but based on family stories I believe her great grandfather did have a severe case. His expressed while he was in military training for WWI and he continued to have problems from there. I hear this is a common way for this particular disease to start causing problems. The physical stress and strain are intense and unrelenting. Too much pressure, repetitive movement, or over extension of the nerves causes damage and although much of it can be recovered if given proper therapy at the proper time, repeated injuries lessen this greatly. Her grandpa, who is now 90 years old and the son of the great-grandfather I am referring to, remembers his dad being tired a lot and resting in the fields. He was a farmer in the small Utah town of Huntsville and thankfully for their family he had the means to hire hands to help him on the farm. He remembers one of his earlier and more severe injuries when he went to lift a saddle onto his horse and lost all strength. His arms were stuck and he couldn't move. Her grandpa went through WWII with little neurological problems but he does have little things. He cannot button his buttons because of muscle loss in his thumbs. They had nerve injuries and the proper therapy was not given so his muscle atrophied. Her father who also has it has had a few injuries in the past, but we never related them until we learned of this disease. It is uncommon in the general population but if it is in your family, it will be very common. I will post the information I wrote about our experience earlier on another blog, a family history blog. Her grand father, after obtaining his medical records, had been diagnosed with HNPP years earlier and so had his father and a cousin. They were even part of a research study at the very same hospital we were taking our daughter to for tests to try and discover what was wrong with her. Her grandpa didn't even realize or remember he had been diagnosed. None of the doctors had impressed upon them the need to share this with their families and to watch for the disease. There is a 50% chance after all that each of his children have it and then those that do the same for their children. I just can't believe that the answer was there all along but because we were not informed, we went through a lot of unnecessary testing, stress, worry and possibly even unnecessary injury. I suppose the doctors only related the disease to their patient's issues at hand. I am very thankful to know now and it is important to me to test my other children so I can make informed decisions when we choose what sports or other programs would be appropriate to hopefully spare them any unnecessary nerve injuries. It is a delicate balance to be a safety net and not a net that ties up their life and keeps them from the joy of it. Growing up with a dad who always taught us to push ourselves and our bodies to the limits and knowing the fulfillment of working all day and hiking beyond what you thought you could do, Pushing your body to achieve and reaping the rewards. I find myself telling my daughter to not push herself, take it easy, don't strain. I feel badly that she may not know the physical joys that come with such achievements, she was not made for intense sports. It isn't safe for her, but it is still her life and her choice but as her mom I want to keep her safe. HNPP affects everyone in so many different ways. Her aunt, who most likely has it based on her injury history, was able to be a marathon runner, but one long bike ride left her hand, arm and shoulder injured for months which led to an unnecessary surgery that didn't help. It is just impossible to know for certain how to protect her so we just try to inform and stay informed and do our best as we go along.